The incident, one of more than 1,000 police killings that year in the U.S., became a flashpoint for protest and activism. WHOSE STREETS?, a documentary by Sabaah Folayan and Damon Davis, focuses on the aftermath of the Brown killing. Davis, a St. Louis artist, was filming the street protests and was joined by Folayan, a journalist who turned to film because she felt the news media wasn't accurately capturing the experience on the streets. The Ferguson protests launched a global movement. It also brought into depressing focus the militarization of local police forces. For five nights, Ferguson's police confronted nonviolent crowds as if prepared for war, with military gear and weaponry: body armor and camo, armed vehicles and rifles based on the military M4 carbine. They shot at protesters with large rubber bullets, and used tear gas and smoke canisters. “All this is chemical warfare,” says one demonstrator. “You're not supposed to be able to use these on U.S soil.” Then president Barack Obama issued an executive order limiting local police access to military surplus equipment; this week, Donald Trump reversed the order, a move that falls in line with his pardon of lawless Arizona Sheriff Joe Arpaio and his encouragement of police brutality (“Don't be too nice” to people in custody, Trump told a group of police officers). The anger reaches fever pitch after a grand jury decides not to indict Darren Wilson. One of the lowest moments the film revisits is Wilson's interview on ABC-TV, in which a sympathetic Matt Lauer allows the baby-faced policeman to tell America that he's not at all a bad guy. “I'm really just a simple guy, that's all I am.” He elaborates on his description of Brown, whom he had described in his grand jury testimony as looking “like a demon” and charging at Wilson. Some eyewitness accounts had Brown at a distance, on his knees, shot in the head with his hands up in surrender. The pattern is all too common: an unarmed black man (or child) is considered dangerous to a police officer, whether he's playing with a toy gun by himself in a park, walking down the middle of the street, selling loose cigarettes or CDs, picking up a toy gun for sale at Walmart, driving with a broken tail light, reaching for a wallet. 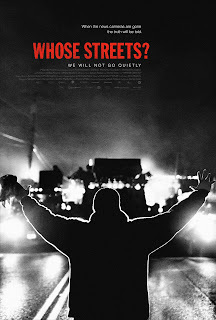 Amid this atmosphere, the film captures the rage, courage and determination of the resistance. “If I'm gonna die,” says Tory Russell, “I'm gonna die for a real reason.” 3 1/2 out of 4 stars.